In my previous posting, I mentioned how Stettler is known for being the home of Alberta Prairie Railway Excursions. We had noticed on their schedule that they were going to be running one of their steam engines on the day after CAMT and we thought it would be great fun to follow the train from Stettler to Big Valley and capture some images and drone footage along the way. Emily and I had the opportunity to ride with Alberta Prairie Railway Excursions (can I just call them APRE from now on?) a couple of years ago. On that trip the train was powered by the 1958 General Motors diesel locomotive. Today they would be running their 1920 Baldwin 2-8-0 Consolidation, badged as No. 41. I won’t go into a detailed history of this old girl, but instead highly recommend you check out our friends at BigDoer.com and their article which goes into great detail about how it ended up in Stettler. We had no problem keeping up with No. 41 all along its trip into Big Valley. We followed the gravel road between the towns, which offered us plenty of level crossings to capture photos. At the first crossing, several of the people on board noticed the drone up in the air. By the second and third crossings, people were waving at us and giving us smiles of recognition — let’s face it, with a bright red pickup truck towing a 23′ fifth wheel RV, we were far from inconspicuous on this run. No one came up to talk to us in Big Valley, however; I guess they were too busy checking out the town and eating their roast beef dinner. This was a really fun outing for us and gave us another excuse to visit Big Valley, which is one of our favorite Alberta towns. Check out the short video I made as a result of our train chasing. This entry was posted in drone, History, Travel and tagged Alberta, Alberta Prairie Railway, Big Valley, Canada, DJI, DJI Mavic Pro, ExploreAlberta, locomotive, Mavic Pro, No. 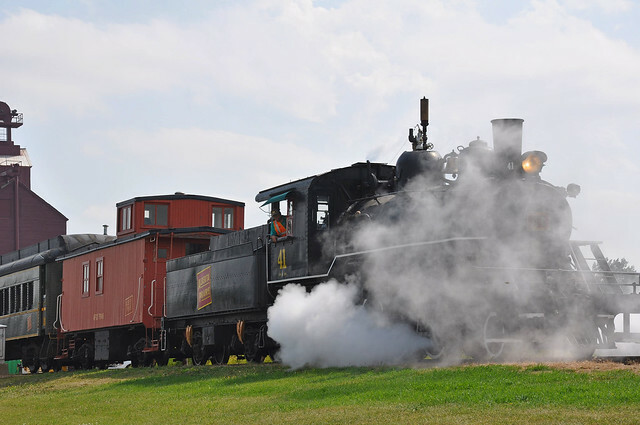 41, railroad, steam engine, Stettler, tourism, travel'. Bookmark the permalink. Great photos! We were on that train a few weeks ago, cool to see it like this. My latest post was about the train but mostly about the roundhouse. Nice job there DanOCan! Great shots. Such a fun ride, which we’re long overdue in doing again. Appreciate the shout out, as always.